The M2-S fingerprint scanner was designed for use with M2SYS' Bio-Plugin™ integration methodology and is also compatible with many standard fingerprint SDKs. The reader's rugged, ergonomic design forces perfect finger placement with each scan to produce an optimized image with maximum captured surface area. The M2-S fingerprint reader has a durable frame providing unmatched durability among readers in the same price category. 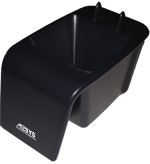 The bottom has a mounting hole allowing it to be easily secured to any surface. 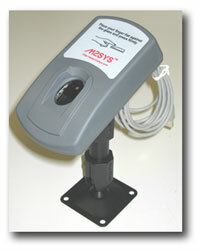 M2SYS also offers 4" and 6" metal stands which the M2-S can be fastened. When mounted on the stand, the angle of the reader can be fully adjusted and locked in place to maximize ease of use. The M2-S fingerprint scanner utilizes the Digital Persona U.are.U 4000 fingerprint sensor. Its on-board electronics control image capture, self-calibration, and image data encryption. The "smart-touch" scanning area recognizes a live finger and rejects latent or counterfeit images. The M2-S fingerprint reader is ideal for use in high-throughput scanning environments where consistency in producing excellent quality images for accurate 1:N identification is critical. The M2-S1 fingerprint reader utilizes best-of-breed RF (radio frequency) swipe sensor technology and enhanced imaging to capture even the most difficult to read fingerprints. Bundled with our Desktop Biometrics Suite, the M2-S1 reader is an excellent choice for smaller 1:N implementations such as POS clock-in, or 1:1 verification deployments. The M2-S1 offers unmatched performance when dealing with unfavorable conditions like: skin damage, dirt, dry fingers, all of which make surface-level fingerprint patterns unreadable. The M2-S1 reads below the surface level at the corium where the fingerprint pattern remains consistent. The unique RF fingerprint sensor makes spoofing by such methods as “gummy fingers” impossible. The M2-S1 is compact and mobile making it the perfect reader for both PCs and laptops. The detachable USB cord makes transporting the device easy. 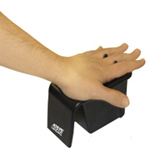 The M2-PalmVein™ palm vein scanner from M2SYS uses a near-infrared light to create a “vein map” of the users palm to perform highly accurate and secure biometric recognition. Unlike other forms of biometric technology, palm biometrics are robust and scan beneath the surface of the skin demonstrating a high tolerance of skin surface problems such as dryness, roughness, moisture, or scarring. With extremely low FAR and FRR rates, non-intrusive contactless authentication, and the highest reliability of all hand or finger based biometric authentication readers, the M2-PalmVein™ scanner is the ideal and most superior biometric reader for all environments. Because vein patterns exist inside of the body, it is practically impossible to recreate someone’s biometric template. 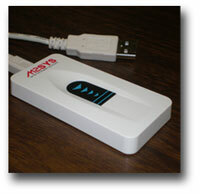 The sensor of the palm vein scanner needs the hand and blood flow to register an image. When using the palm vein reader, the hand does not have to touch the sensor which improves hygienic concerns and scanner durability. For those utilizing the hand guide, the device is easy to clean and keep sanitary without compromising the performance of the actual biometric sensor. Palm vein technology can implemented in both 1:1 and 1:N matching environments. The new M2SYS Hybrid Server™ enables users to implement fingerprint, finger vein, palm vein, and iris recognition technology on the same server platform. Can be deployed in a variety of implementation settings. Can be used by anyone – the palm vein scanner has virtually no physiological restrictions. Sophisticated algorithms allow for near 100% accuracy every time. High tolerance of skin surface problems, e.g. roughness, moisture, and dirt. High level of user acceptance. 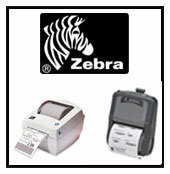 More affordable than other palm vein readers in the same category.